The largest crocodile seen in decades in Queensland was found dead over the weekend with a bullet in it’s head. We claim we want to save our wildlife, yet Governments and Citizens alike still show zero tolerance for animals that pose risk to humans, even when in the territory they’ve occupied for millennia. The problem is exacerbated as we increasingly live, play and work in what have historically been wilderness areas. Going back to the crocodile just shot, local Police and state environmental officers are investigating after the 5.2m male reptile was found floating in the Fitzroy River on Thursday. John Leaver said a 5m-long crocodile had not been caught in Queensland for 30 years. 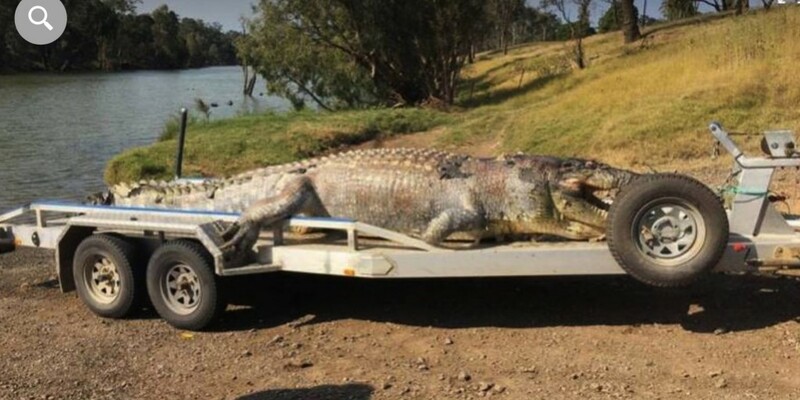 Leaver, who ran a crocodile removal service across the state for 20 years, said the largest one he ever caught was 4.95m in the late 1980s. The farmer said Rockhampton locals used to shoot crocodiles “equal to that size” in the 1930s, 40s and 50s. But nothing that big until the weekend. Technically of course, crocodiles are now protected in Australia, however this hasn’t stopped them being killed by locals who see them as a threat, or sport. This problem is exacerbated as Australian cities sprawl further into estuarine areas, as houses move further into the bush, and as tourism encroaches more into remote areas. Crocodiles should be celebrated, but we as humans believe we have divine rights over wildlife. This all raises an interesting question that is not limited to Australia of course – People increasingly want to live and play away from the cities, as long as there are no dangerous animals. The problem with this of course is the dangerous animals (such as crocodiles, alligators, snakes, spiders, tigers, lions, bears) are just part of a healthy ecosystem, and by removing them, we skew the ecosystem, as well as reduce its biodiversity. Australia raised conservationist’s hackles with their absurd shark cull program in Western Australia, that needlessly killed hundreds of sharks. I have no problem conceding it is a horrific experience when someone is badly injured or killed by a shark, but the numbers are so low, compared with other risks locals face. Between 2000 and 2015, just 15 people were killed by shark attacks in WA. For the same period, over 900 people drowned in WA waters, over 1,000 people were murdered, and over 1,500 people died on their roads. Each one a tragedy of course, but just one death by shark per year in no way justifies the killing of critically endangered animals. Nor would 20 deaths per year for that matter. You swim in the oceans you take the risks. Otherwise go swim in a pool or a fenced area.